ST. GEORGE – Speculation could be coming closer to reality when it comes Mitt Romney running for Senate, as the former Massachusetts governor and 2012 Republican presidential candidate reportedly sent a text message to a friend telling him he plans to run. Beyond this, no official announcement has been made regarding Romney’s potential Senate bid. Until then, speculation continues. Should he jump in, Romney will be running for the Senate seat to be vacated by retiring Sen. Orrin Hatch. The 83-year-old Hatch, who has served in the Senate for over 40 years, announced earlier this month that he will not be seeking an eighth term in office. President Donald Trump had urged Hatch to run for re-election, reportedly so he wouldn’t have to deal with Romney in the Senate. 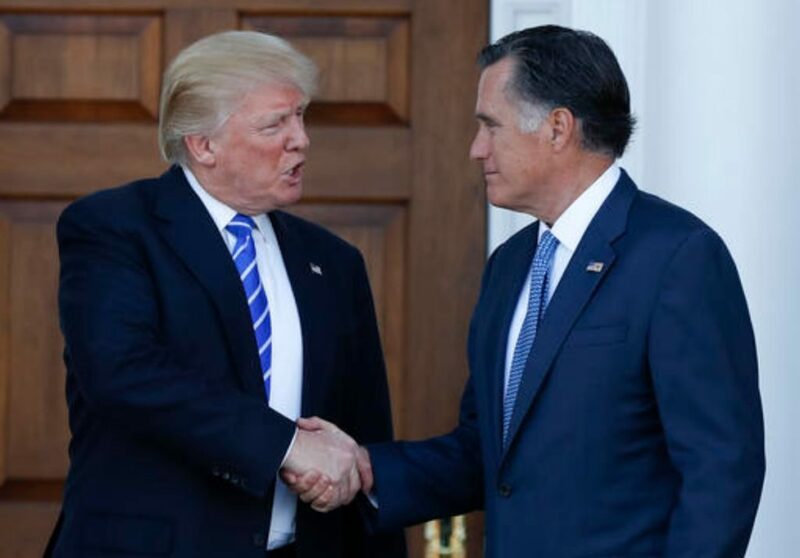 Trump and Romney haven’t had the best of political relationships in the past, as Romney referred to Trump as “a fraud” who had “neither the temperament nor the judgment to be president” during the 2016 campaign. In response, Trump called Romney “a choker” who “walked like a penguin” and lost a “winnable” race to President Barak Obama in 2012. Trump nonetheless anounced Romney as one of his potential picks for Secretary of State following his election. However, that position ultimately went to Rex Tillerson. Some have interpreted this as Trump’s way of getting back at Romney. If he runs and is elected, Romney is seen by some supporters as a possible counterpoint and opposition to Trump. Various individuals have encouraged Romney to run, such as former Vice President Joe Biden and Senate Majority Leader Mitch McConnell, R-Kentucky. Recently Utah Gov. Gary Herbert said he would like to see Romney run as well. During a teleconference last week related to Herbert’s testimony regarding proposed legislation connected to the Bears Ears National Monument, he was asked if he thought Romney should run for the Senate. The people of Utah will likely support and rally around Romney as a senatorial candidate, he said. Romney is popular in Utah where he is held up as the man who led a turnaround of the scandal-plagued 2002 Salt Lake City Olympics and as a prominent Mormon businessman and politician in the state that is home to The Church of Jesus Christ of Latter-day Saints. Originally hailing from Michigan and Massachusetts, Romney relocated to Utah just within the last few years. The Daily Mail pointed out Sunday that Romney updated his Twitter bio as being from Holiday, Utah, and no longer Massachusetts in the wake of Hatch’s retirement announcement. The action was characterized as a possible hint suggesting a pending Romney Senate run. “We have have people out there, but certainly, when it comes to polling, and who I think has the best chance of winning – there’s nobody better than Mitt Romney,” Herbert said. Others who have declared their intent to run for Hatch’s seat in 2018 include Democrat Jenny Wilson, who currently serves on the Salt Lake County Council, and Republican Larry Meyers, a St. George attorney. Romney – along with other potential candidates – has until March 15 to file their candidacy with the state. Ed. Note: Jenny Wilson was previously reported as being a member of the Salt Lake City Council instead of the Salt Lake County Council. This error has been corrected in the body of the text. Well, I definitely wouldn’t trust that “friend” to keep a secret. Romney should have just tweeted it. I don’t think a guy like Romney should get in the Senate. Especially when democrat Biden recommends him plus he is a dishonest Mormon bet his bishop took his recommend. No mitt the twitt!!! Just put him in office already. He has already won the ” minds ” and hearts of the majority of Utah. Baaaaa. Baaaaaa. I won’t vote for Romney. I believe Romney lost the Presidency against Obama, there was so much he could have done to win that he didn’t do and we were all punished by having Obama in another 4 years. In addition, the way he opposed Trump was horrible and help to create the chasm that exists today. Please . . . someone else who cares about this country, please run! Not voting for Romney. However, the election was loss do to the lying MSM. Trump called it out and won. Period. In the future, anyone not in bed with the liberal media should keep pointing every Pravda like action of media. Romney should be the next LDS Prophet, not Utah senator. He is rich, self-righteous and full of scrap. A perfect fit. Larry Myers is a Constitutional Conservative who is NOT a carpetbagger. Larry Myers lives in a sh**hole. Clean that mess up first. Spend some time on your property instead of TRYING to run for office. If your place looks like that from the highway what is going on INSIDE? Don’t like him? Don’t vote for him, slander is a crime you know? I think you have sh## for brains..